The requirements for flying your rocket are to complete a test flight (using a low-power motor to test the stability of your rocket), recover your rocket and complete a second flight to accomplish a specific objective. There are several different off-the-shelf rocket models that have special payloads for this "specific objective": camera rockets, egg lofters (see if you can launch and recover an egg without breaking it - model rocketeers do it all the time, HONEST! 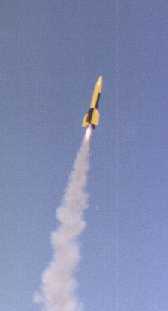 ), and others, like electronic altimeters to measure your rocket's altitude. If you don't already have an idea in mind, a good one is to compute/predict the altitude that your rocket will fly, then verify that altitude during your flight. This is relatively easy, can be done with any rocket, and using the simple method proposed below, is not at all expensive. I give you two methods here - the first one is to go to a site which will run a flight simulation for you, showing you thrust, timing, velocity, and altitude for the entire duration of your flight. The second provides you with the equations and lets you perform the calculation yourself. It's not for the arithmetically challenged. Go to Model Rocket Altitude Predictor - oh, is this ever cool. Go to Launcher: my Java rocket simulator - a running simulator and the source code used to write it. Go to Rocket Equations: for the mathematically brave. I propose the simple and cost effective solution. Unless you're in a competition, it's plenty good enough. This is referred to as the "Elevation Only" method, and requires only a single observer and simple gear. Start by making up your elevation-only tracker. You can buy one at a hobby store for $18.95, or make it up for 50 cents. It can be made by hanging a string from the pivot point of a protractor with a weight (say, a washer) tied to the end of the string. Your observer stands distance D (about 300-600 feet, or 100-200 meters) from the launch pad. Alternatively, you take the tracker and stand 300 feet away, and let your observer launch the rocket instead. Site the rocket down the flat side of the protractor (now your tracker) and track the rocket from launch to apogee (the highest point of flight). You may want to tape a straw to the flat side of the protractor and site down the straw. Let the string hang freely until the rocket reaches apogee, then clamp it with your finger at apogee. The string now indicates the elevation angle of the rocket at it's highest altitude. Call this angle "A". Note: check your protractor to see if it reads either 0 or 90 when you look straight ahead. If it reads 90, then you will need to take your protractor reading and subtract it from 90, so that when you're looking straight ahead you get 0 degrees and when you look straight up you get 90. For convenience, I have listed some values of the tangent for various values of angle A here. This table is in very plain form so you can easily print it for reference.